This week, from Monday, March 25th through Sunday, March 31st, we will focus on collecting items for the Women of Charity Easter Basket project for our children at Good Shepherd and St. Isidore’s. Items needed include: individually wrapped candy, small packs of crayons, coloring books, colored pencils, erasers, stickers, and small stuffed animals/toys. ​These donations may be placed in the Women of Charity Donation box located in the Gathering Area or in the 40 cans 4 Lent boxes located in the Gathering Area by the Share Table and Entrances to the Church and Social Hall. Join us in the Gathering Area between the 8:30 and 11:30am Masses for discussion, coffee and fellowship. Come every week or whenever your schedule will allow. Share your knowledge, learn about the Gospel, our Church and grow in your faith. April 27, 2019, 1:00pm- 4:30pm, Social Hall. Our goal is not to remind you of how great your loss is, but to validate your pain in acknowledging you lost a beautiful and irreplaceable child. Following the retreat, a Memorial Mass at 5:30pm for all the children will be celebrated. Childcare will be provided. Snacks and drinks will be provided for parents and food for children. There is no cost for the retreat and is open to all. 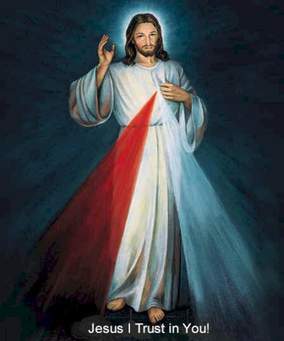 The Feast of Mercy or Divine Mercy Sunday has been celebrated in many countries, dioceses and parishes for many years. In 2000 St. John Paul II decreed Divine Mercy Sunday (the Sunday following Easter Sunday) a solemnity, a high feast day. Saint Pope John Paul II had proclaimed, "I give thanks to divine Providence that I have been enabled to contribute personally to the fulfillment of Christ's will, through the institution of the Feast of Divine Mercy. Please join us for this devotion on Sunday, April 28, 3:00pm. What is the Divine Mercy Novena, how and why do I pray it? While the Chaplet can be said anytime, the Lord specifically asked that it be recited as a novena, promising that “By this Novena (of Chaplets), I will grant every possible grace to souls” (Diary 796). Day 1 - All mankind, especially sinners. Day 2 - the souls of priests and religious. Day 3 - all devout and faithful souls. Day 4 - those who do not believe in God and those who do not yet know Jesus. Day 5 - the souls who have separated themselves from the Church. Day 6 - the meek and humble souls and the souls of little children. Day 7 - the souls who especially venerate and glorify His mercy. Day 8 - the souls detained in purgatory. "I desire that during these nine days you bring souls to the fountain of My mercy, that they may draw there from strength and refreshment and whatever grace they have need of in the hardships of life, and especially at the hour of death" (Diary, 1209). The Novena of Divine Mercy and the Chaplet of Divine Mercy are both wonderful ways to put into action a Spiritual Work of Mercy: Pray for the living and the dead. You can pray the chaplet at 3:00pm every day or any time, anywhere for the benefit of others, and at the same time grow in faith for yourself. First Friday in May, May 3rd we will offer Exposition of the Blessed Sacrament beginning at 6:00pm and end with the Benediction on Saturday, May 4th, 8:00am. This is a peaceful and prayerful time and is open to everyone. ​Sign–ups are available on the board beside the Welcome Table in one hour increments. More information to follow in the upcoming weeks. addressed. It has arranged a monthly gathering for adults called "Timely Topics." On the last Tuesday of each month, a different topic will be addressed by various speakers in the Gathering Area, 7:00-8:00pm. Good Shepherd Parish Council, along with our Ministries, will hold a BINGO Fundraiser for our Parish, Saturday, November 16, 2019, 7:00pm in the Social Hall. The night will consist of BINGO, a 50/50 Drawing and Basket Raffle Drawings. At this time we are looking for donations of basket raffle items and accepting donations for Sponsorship. If you have a raffle item to donate, please contact Deborah Aberg, 910-489-8336. For monetary donations, contact Janice Scott in our Parish Office, 910-425-1590. If you have any further questions, please contact Saundra Hall, 330-692-1817. Mark your calendars!! Thank you and we look forward to having a great event with fun for the whole family! Help Good Shepherd receive funds by Shopping online at Amazon. AmazonSmile purchases to the charitable organization of your choice. Sign In or create an Amazon account. If you would like to participate, once logged in, on the line “OR Pick your own Charitable Organization” type “Good Shepherd Catholic Church, Hope Mills” choose “Select” click “Yes” and Start Shopping. If you already have a non-profit for Amazon Smile and you like to change to Good Shepherd Catholic Church, due to several names “Good Shepherd,” please type “Good Shepherd Catholic Church, Hope Mills”. Stop by our CD Stand in the Gathering Area and check out our New titles. Lighthouse Catholic Media also has a CD of the month program. For more information, visit the website and use the Promo code listed on the back of the CD. We sell bundles of two CD’s for $5.00 and single CD’s for $3.00 each. Come and check them out today. Have you been blessed by God? The rest of the parish would like to hear about how you’ve been blessed by God in 2017 or 2018. Please send an email telling your experience to Pete Reilly at PeteTroy5338@yahoo.com. You can give as much (or little) information as you like. Or stop by the Coffee Bar after the 8:30 am Mass and tell him in person. Widows Support Group “Widows Watch” ministry meets on the first Friday of the month in Room 2 of the church, followed by celebrating noon Mass and enjoying lunch afterwards. Our time together involves getting to know women of the Bible as well as ourselves. Being united as widows, this bond of fellowship and similar circumstances fosters support for one another. Any widow is welcome. Questions: Contact Camille Grupy, 910-424-6802. If the answer is yes – or perhaps you are just curious - there is an opportunity to meet with men in our parish who have profited in many ways by integrating our Faith into their everyday lifestyle. Our Men’s Spirituality Group meets the 2nd and 4th Thursday of the month, 7:00pm, Room 4. Questions or need more information? Speak with Deacon Pat, 910-818-0801. We have incurred several items in our Lost and Found—reading glasses, sunglasses, books, toys, umbrellas, etc. If you think you may have misplaced an item, please check the Lost and Found area in the kitchen airlock under the wooden mail slots. If you have lost any of the items below — a house key, key fob, rosary, etc. - please contact Janice Scott, 425-1590. Have a Suggestion for the Parish? If so, use the Parish Pastoral Council Suggestion Box located on the Welcome Table. If you have a Suggestion, fill out the form located on the side of the box and place in the slot. The Suggestion Form can also be found on our Pastoral Council page. Anonymous suggestions will not be answered. Please help pray the Vocations Prayer that is prayed with the Chalice. Heavenly Father, Bless your church with an abundance of holy and zealous priests, deacons, brothers and sisters. Give those you have called to the married state and those you have chosen to live as single persons in the world, the special graces that their lives require. Help those who have embraced the consecrated life to live up to their promises. Form us all in the likeness of your Son so that in Him, with Him and through Him we may love you more deeply and serve you more faithfully, always and everywhere. With Mary we ask this through Christ our Lord. Amen. Fast each Wednesday of the week. Please remember that you can do a full fast, a partial fast or other type of self-denial. Have you participated in the Parish Fast? Are you planning to participate in the Parish Fast? Help the parish grow by inviting someone you know who has fallen away from the church to come to Mass with you one weekend. Or invite someone new who is not Catholic. God is always calling new people to him and asking us to live out our baptismal call. What better time since we hear so much negative publicity about God and church? We might not be able to bring God and prayer back into school and our government, but we can bring people into the church. You have chosen the parish as a place where you encounter us in our daily lives. The parish is the assembly in which your Word is proclaimed, your Eucharist is celebrated, your people are united in a local community, and gathered into various ministries, so that they may become the agent of change for the renewal of the whole Church. Make our Parishioners aware of the many opportunities and responsibilities that are theirs to grow as disciples of Jesus and as witnesses of you to our friends and neighbors. Keep us open to our need of your love and fellowship. Let both clergy and laity work together in harmony to serve you in others. We fervently ask this in Jesus' name.